Today is Vijayathasami. The tenth day after the nine days of the Navarathri festival. It is considered auspicious to start new learning on this morning. Children who will be starting school in the coming year will have their ‘eadu thodakkal’ ceremony. The ‘eadu thodakkal’ is a ceremony where toddlers trace their first alphabets on a tray of grain and is usually held at the temple with the priest conducting the ceremony. One of my friend’s twins will be starting their ‘eadu thodakkal’ today and I feel sorry for her as they are two energetic boys who can’t keep still for a minute and I hope that she manages to keep them engaged at least for the alphabet tracing part. For Vijayathasami, we have never really done anything at home other than visit the temple. At the start of the Navarathri, both at the temple and in the home, people plant the seeds of nine varieties of grain (nava thaniam) such as moong dal, chickpeas, urad dhal, kurakkan etc. and on the tenth day, the sprouts are collected and placed before the shrine in the home. The sprouts are supposed to symbolize growth, luck and prosperity. As a child, I used to keep a few of the sprouts in the school book of the subject that I wanted better grades on. Today’s recipe for Vijayathasami is a non-traditional one – the recipe for my mother’s passion fruit cake as we enjoy baking at home. Whisk the sugar and margarine till creamy. Add ½ cup of water, passion fruit, yoghurt to the creamed sugar and margarine and blend for about 2 mins. Add ½ tsp baking soda and 1 tsp baking powder. Stir in the flour and semolina gradually. Add a few drops of rose essence. Transfer to baking tray and bake for 45 mins at 170⁰C/340⁰F. Remove from oven and let the cake cool while you prepare the icing. Whisk 2 tbsp margarine, 6 tbsp icing sugar, 1 tsp lemon juice until creamy. Add a few drops of vanilla essence. Spread the icing over the cake evenly. The recipe I would like to share today is the recipe for a pie that my mother made recently. It was delicious and very filling and included lots of vegetables and even passion fruit and peanuts. Make the dough for the pie base by mixing the wheat flour, margarine and salt, to taste and kneading it. Let the dough rest while making the filling for the pie. Boil the tomatoes and mash them slightly. Boil the potatoes and cabbage. Heat 2 tbsp oil in a pan and fry the ginger and garlic. Then add the onion and crushed peanuts and fry for a few minutes. Add the slightly mashed, boiled tomatoes to the pan and then add the carrots followed by the green peas and finally the potatoes and cabbage. Add pepper and salt, to taste. Keep aside the vegetable filling. In a saucepan, heat the soya milk with 2 tbsp urad dhal and 1 tbsp wheat flour. Bring to a boil, adding salt and pepper, to taste. When the sauce begins to thicken, add the pulp of passion fruit to give the mix a tangy and fruity flavour. Take the pie pan and roll out the pie base, covering the pan. Spoon the vegetable filling on top of the pie base and level it smoothly across the pan. Pour the tangy batter-like sauce over the vegetable filling. 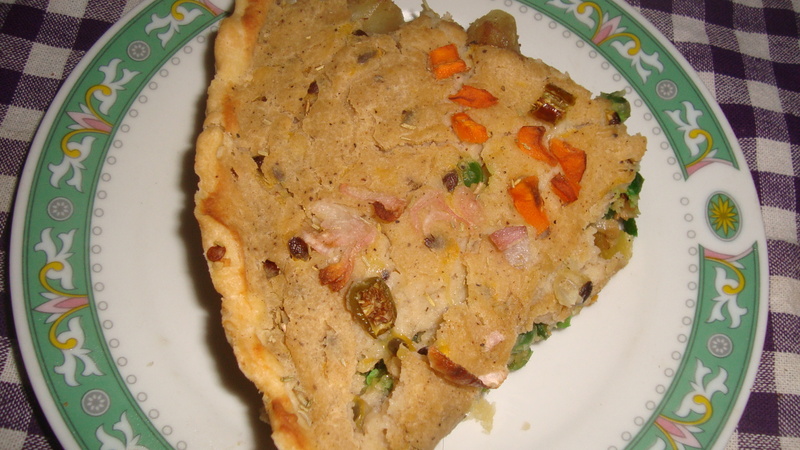 Sprinkle chopped onion, capsicum or green chilli and the rosemary and sesame seeds over the sauce covering the pie. Bake for 30 – 40 mins at 220⁰C/ 428⁰F. Serve hot with some spicy chutney or sauce. 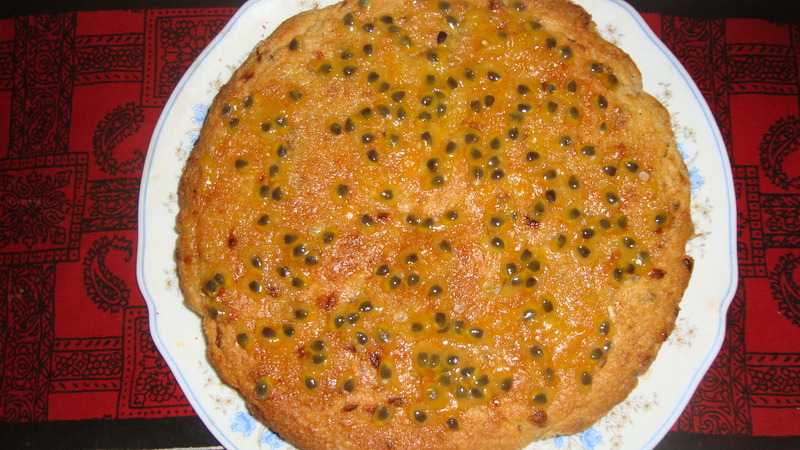 Last week, when my mother bought some passion fruit, I had mentioned that I had seen a delicious looking orange and passion fruit syrup cake recently on Poppy’s Patisserie. 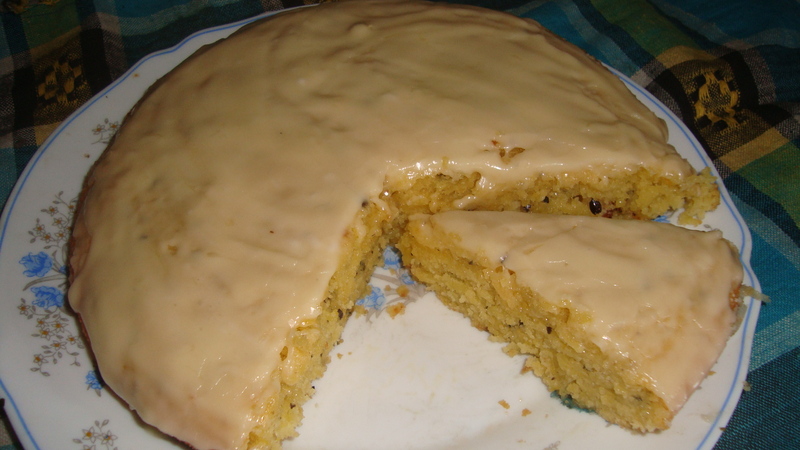 The very next day, my mother had baked a tangy, crunchy passion fruit and banana cake. 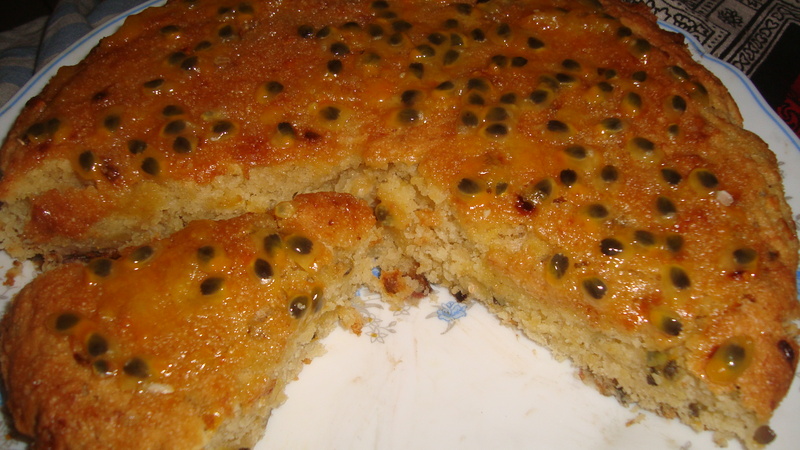 The crunchiness is from the baked passion fruit seeds inside the cake. 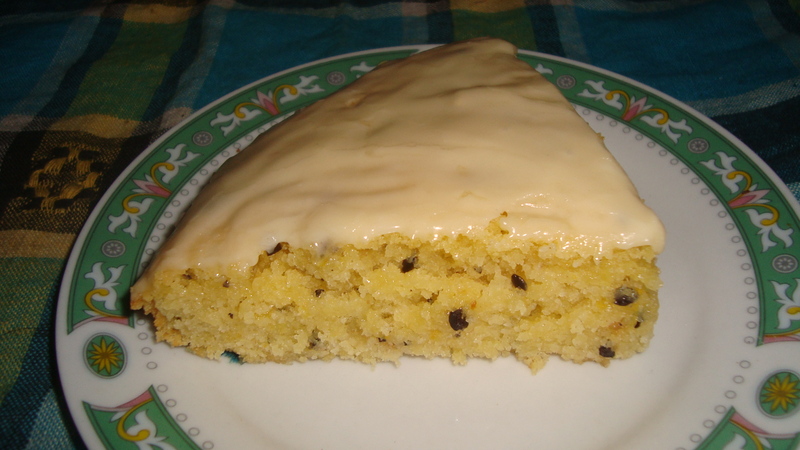 I would like to share my mother’s recipe for this delicious dessert cake today. Sift the wheat flour and semolina together with the baking powder and baking soda. Keep aside the dry mix. In a large bowl, whisk the margarine and sugar by hand, using a large spoon. 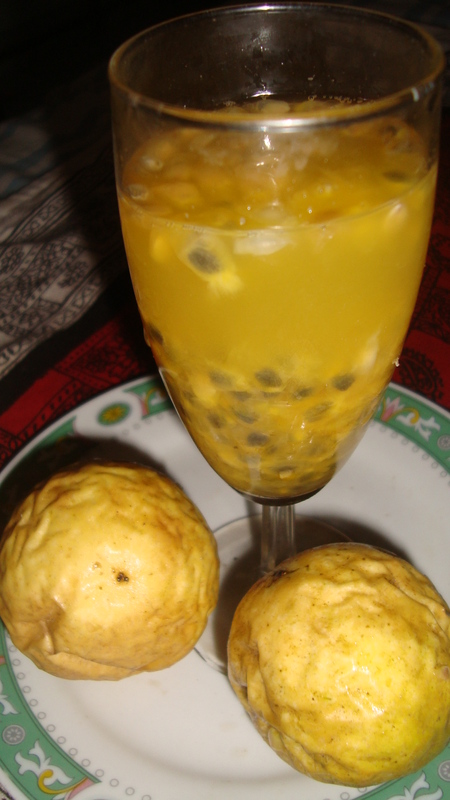 Mix the passion fruit pulp, including the seeds, and the oats with the water in another bowl to make a wet mix. Stir in the wet mix into the bowl containing the whisked margarine and sugar and continue to whisk. Add in the finely chopped banana and the drop of rose essence into the bowl and mix. Stir in the dry mix into the large bowl of the wet ingredients gradually. Pour the cake batter into the baking tray. Pre-heat the oven and bake at 140⁰C/ 284⁰F for 45 mins. Beat the pulp of 1 passion fruit together with the 2 tbsp of white sugar and pour over the baked cake, while still hot from the oven.